Our feet carry us around for the entire day. They are stressed beyond their limits while climbing stairs, running errands, chasing children, standing and performing our full-time jobs, and exercising daily. It's no wonder that stress can build up in the feet. At the end of a long day, a good foot massage can seem to attack the stress of the day. Your mood can go from annoyed and tired to relaxed and refreshed at the end of a proper massage. Along with being a mood booster, foot massages can do much more serious healing to the body like relieving pain and improving circulation. While your significant other might give you a foot massage occasionally (or if you give yourself a foot massage), you need the constant, consistent relief that going to a spa can provide. The technicians in the spa really know how to hit the tender spots and relieve stress since they've been trained. Unfortunately, it's unlikely that anyone can afford to spend every day in a spa for a proper foot massage. A foot massage is the best alternative to going to the spa or begging your significant other for a massage every day. It's convenient as well as saves you money. ​What Exactly Does a Foot Massager Do for Pain and Circulation? Who Benefits from a Quality Foot Massager? Do You Know What to Look for in a Good Foot Massager? ​The Brookstone Shiatsu Foot Massager is one of the most versatile massagers available for customers. With the range of settings, you can control the intensity of the massage throughout the time it's used. ​For example, at the end of a long night, people can have serious pain that can't handle deep, intense kneading. For this purpose, the massage can start with the Soothe feature. It's a gentle, light touch of the feet. ​As the user's pain is relieved, the massager's settings can be increased to provide an energizing rub that begins to improve circulation as well as provide relaxation. This setting is called Energize, and it's the strongest massage option. ​Between Soothe and Energize is a Pulse option that provides soothing relief and brisk, deep muscle relief in a pulsating rhythm that increases blood flow to the feet. The user is in complete control of the intensity. 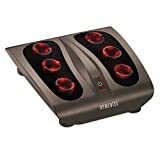 ​There are various heat settings to be explored with the Brookstone Shiatsu Foot Massager, too. The heat and the pressure of the 3 automatic massage programs will give the user a massage to rival any given by a spa technician who is well-skilled in reflexology massage. Many customers claim it's the best foot massage they've ever received from a machine. Other customers report that it works exactly as was advertised. Many customers use it more than twice a week without a breakdown of the product. Not intense enough for deep heel pain. The noise level could be bothersome. ​Doctors and therapists have been recommending this foot massager to their patients for years. It's great for circulation in the feet as well as the legs. With 11 speeds, it's an incredibly powerful machine, and one of the most powerful on the market for the public. Diabetics often have circulation problems in their feet that can result in serious health issues. This is one of the most popular machines for patients. ​The settings range from 1,000 rpms to 3,700 rpms, which gives such a wide range of speeds that it can be helpful to those who want a soft, gentle massage to those who want a deep tissue massage. ​Those dealing with serious health issues like diabetes, plantar fasciitis, or circulation problems will be able to combat all of that with the right speed dedicated to their needs. It's the best foot massager for plantar fasciitis pain. If the user has a problem with his or her feet, the MedMassager MMF06 11 will be able to tackle and defeat it. ​The massager is angled for comfort while providing an Arch Bar for those with high arches who need deep relief. Other features include an oscillating foot pad and durable construction. There's a special pad that is made to pay special attention to the pressure points in the foot. ​The massager has an optional lifetime replacement warranty as well as a 1-year warranty against defects. Customers with numbness in their feet saw relief with continued use. Many users report that their feet were warm and felt great while using the massager. Some customers saw reduced swelling in their feet and legs after using the massager twice a day for 15 minutes each time. The unit can be somewhat noisy. The massager's lowest setting is too strong for some. ​While some foot massagers there are pads that the foot pain sufferers places their foot on, the uComfy Shiatsu Foot Massager in a machine that circles the foot. This allows the top and the bottom of the foot to be treated as a whole. There are five levels in this foot massager that can be changed using a plus and minus key on the controls. This allows the massage to be deeper or softer depending on the user's preferences. When the massager is working on the top and bottom of the feet, it can be quite intense to have the settings high, if unaccustomed to the pressure. Along with pressured massage, there's heat that moves through the machine encircling the foot. This can relieve the cold feet of people who have limited circulation. The heated massage is so relaxing that the manufacturer created an automatic shutoff of 15 minutes in case the user drifts off to sleep. Users can start the massager again immediately, if they'd like to continue. ​The shiatsu therapy is much like what's received at a spa with trained technicians. The unit has a washable cover, and the entire unit is portable. Customers report that they had to work up to just the third level of massage since it's so strong, but that they enjoy every minute of level 3 now. Many users say that the massage is much like a reflexologist's hand motions while giving a massage. Many customers love it for their plantar fasciitis. Some customers couldn't discern the heat. In a few cases, there were cracking sounds within the unit. The Homedics FMS has a pad where the user will place his or her feet. Under their feet are 18 nodes that will hit all the pressure zones across the foot. The massage nodes are accompanied by 6 rotating heads. This gives the user a distinct Shiatsu massage style that helps with pain relief. There's heat in the pad as well. They pay special attention to the heel as well as the arch, which accounts for much of the pain that people experience in their feet. To control the unit, all the user has to do is press the power on or off button with their toe. 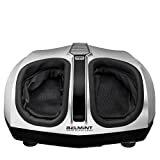 This heated foot massager is one of more affordable options on this list since it's missing some customization. While it's a simple foot massager, it does have all the features of some of the more expensive options like massaging nodes and heat. The unit was quieter than some customers expected. The massage rollers weren't too hard or painful customers reported. Some chronic foot pain sufferers experienced noticeable relief after only a week of use. The heat option wasn't as strong as some would like. ​While some foot massagers allow users to control the level of heat, this foot massager has settings that allow the heat to be turned off completely. There are two areas for massaging the feet. One of the massage areas is the bottom while it also offers massage on the sides of the feet, too. There are 3 intensity levels for the vibration and the ability to heat the unit to 140 degrees F if the user wants intense heat deep in the foot. It takes some time to heat the entire unit to that temperature. The rollers and vibrators are concentrated on the front of the foot, which can bear more weight than the back. The control panel is on the unit itself and allows the user to customize the level of heat and depth of the massage. The plus and minus signs will increase or decrease pressure while adding a kneading to the massage. This warming foot massager has an automatic shutoff after 20 minutes in case users become so relaxed that they fall asleep. The cloth in the unit can be removed to be washed, which keeps the unit clean and sanitary around an area like the feet. Customers love the multiple settings for changing the pressure. Many customers remark that it cleared up their plantar fasciitis. Massage is too vigorous for arthritic feet. For some, the ankle pads squeeze too hard. ​The best foot massage machines are ones that have a variety of settings as well as heat to really penetrate into sore muscles and increase blood flow and circulation. They can work for people with diabetes-related foot issues as well as those who have plantar fasciitis from running or standing all day. The MedMassager is the one that's most recommended by therapists as well as doctors. With 11 speed settings, there's a sweet spot for every person who has foot pain or poor circulation. 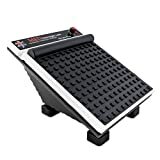 Between the recommendation of doctors and the positive comments and results from foot pain sufferers, this is the best overall foot massage machine. Users had great things to say about the Brookstone Foot Massager. The three very different massage types and levels work incredibly well for those with serious foot-related issues like poor circulation and pain. ​There are many benefits to a foot massager. One of the biggest benefits is that you can save tons of money and time by not having to make appointments at a foot massage spa. All of the reflexology knowledge and precise handling of the foot can be done with a machine. Tight, painful muscles and tendons can restrict blood flow to the foot. Those with chronic pain from standing as well as those who have diabetes will notice that they might have cold spots on their foot that is devoid of feeling. It's quite dangerous, but can be relieved with a good foot massager. ​Those who have never used a massager will wonder about the benefits. Those who don't have serious health issues will still be plagued by aching feet if they've been running errands or standing on their feet all day. Who else will benefit from a massager? Those who run for exercise. With repeated and regular use, a foot massager with heat will loosen the muscles and reduce the risk of injury. When a runner is fatigued or their muscles are sore, it can impact their gait. That can lead to injury (1). Frequent runners may even want to consider a foot and calf massager. Anyone with arthritis in their feet. Active and inactive people can both suffer from arthritis in their feet especially with repeated abuse on the poor foot. Massagers can soothe muscles and sore joints quite well (2). Well-heated and properly moving joints help the person function normally. Those with poor blood flow and circulation. Foot massagers will warm up the feet, which loosens the muscles, tendons, and joints for easy of blood flow. It can also decrease the risk of blood clots in those with circulation issues (3). Plantar Fasciitis sufferers can benefit. This can plague runners, people who stand on their feet, or those who are overweight. There's a tendon that runs from the big toe to the heel, and this can be damaged when it's tight and overused. That's why it's seen in runners more than others. With a massager, the tight tendon can relax and sufferers can feel less pain within a few days (4). ​While you know exactly why you need a foot massager, you might not know what types and styles are available to help with your foot issues. Manual – These massagers have a ball on them. You can rub them over your foot or place them on the floor and push your foot back and forth over them. Electric – A massager with a motor is plugged into the wall. The motor vibrates rolling heads with heat along the foot. Shiatsu – This is a kneading method that is performed by massage therapists who are knowledgeable and trained. The massager is meant to mimic the Japanese method of massage. Infrared heat therapy – Heat and massage are used on the foot and calf for relief. Foot massager spas - Electric massagers that use water and heat to relieve pain and relax muscles. F​​​​eatures for these types of massagers are variable speeds, different types of remote controls, cushioning, portability, various heat settings, and pressure functions. Surface Cushioning. The cushioning surface will bring comfort to the feet while being massaged. The feet have been on a hard surface most of the day and need relief. Some cushioning conforms to the feet, too. Speed Options. This option helps to customize the experience. Some users want fast, deep relief while others want slow relaxation. The bottom of the device should have a non-slip surface so fast speeds don't vibrate it across the floor. Options for Control. Many foot massagers have a control panel on the device. Others have a remote, which makes it easier to make changes while relaxing. Various Heat Options. Some devices have the option for no heat at all, but many users want the heat for loosening tight, sore muscles and tendons. Heat can be applied to various parts of the foot, too. ​A proper foot massage isn't a pampered luxury that should only be available as a treat during a spa retreat. For some with serious issues, it can relieve pain and reduce stress while being a boost to the person's general well-being. In some cultures, there's a belief that foot reflexology can have an impact on the person's overall health due to the application of pressure to points along the foot. There is a solar plexus reflex on each foot that is thought to relieve stress when pressure is applied. At the very least, a massage with their eyes closed is bound to relax anyone. Tight muscles and tendons can block proper blood flow and result in bad circulation. Whether a person believes in reflexology or not, a massage can bring about a rejuvenation from a greater sense of well-being and relaxation. People don't often realize how much we rely on our feet until there's pain, stiffness, or ailment that impacts the foot. A good massage can eliminate current problems as well as future issues.